U.S. President Barack Obama called the Kremlin before announcing that Osama bin Laden had been killed. Vladimir Putin was the first international leader to call George W. Bush after the terrorist attacks on Sept. 11, 2001. Now President Barack Obama has returned the favor, notifying the Kremlin that U.S. forces killed 9/11 mastermind Osama bin Laden before making the public announcement. "We appreciate it that the Russian authorities were sufficiently informed before the official statement by U.S. President Barack Obama," the Foreign Ministry said May 5, in a brief statement. The ministry did not elaborate on the U.S. tip-off, and the Kremlin made no comment about it in a separate statement, where it pledged to expand cooperation with the United States in the fight against terrorism. Russian officials have made numerous claims about al-Qaida's involvement in the insurgency in the North Caucasus, and the man tipped as bin Laden's likely successor even spent several months in a Dagestani prison in the 1990s. But, security experts said May 2, the link between al-Qaida and the North Caucasus is largely symbolic, and bin Laden's death will have little impact on the Russian insurgency. Obama announced just before midnight May 1, in Washington that bin Laden had been killed by U.S. forces in a special operation outside the Pakistani city of Islamabad. The manhunt had lasted for nearly a decade after bin Laden claimed responsibility for the 9/11 attacks. Despite the late hour, thousands of people converged on the White House and took to the streets in major U.S. cities to celebrate the news. "The Kremlin welcomes the serious success achieved by the United States in the fight against international terrorism," the Kremlin said. "Russia … regretfully knows what al-Qaida is from experience." The Kremlin statement said that only unified efforts could fight global terrorism successfully and pledged to expand cooperation toward that end — a promise similar to one made by then-President Putin when he called then-President Bush shortly after the 9/11 attacks. The phone call marked a turning point in U.S.-Russian relations at the time. In its statement Monday, the Foreign Ministry likened bin Laden to slain Chechen warlord Shamil Basayev and the U.S. anti-terrorism operations in Pakistan to Russian security services' own operations in the North Caucasus, where, it said, a hunt continues for al-Qaida emissaries. 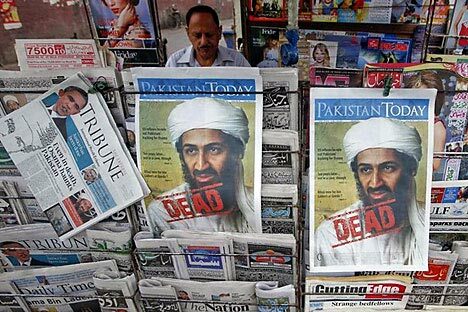 Konstantin Kosachev, chairman of the State Duma's International Affairs Committee, said Monday that bin Laden had been involved in attacks on Russian soil. "We have grounds to believe that Osama bin Laden was involved in several terrorist attacks that took place in our country," the senior United Russia lawmaker said, without elaborating, in a statement published on United Russia's web site. Kosachev also warned that bin Laden's death might spur a series of retaliation attacks by international terrorists. Moscow police boosted security around the U.S. Embassy on May 2. North Caucasus insurgents have several times attacked public venues in Moscow, but they've never specifically targeted U.S. or other foreign buildings here. Only one U.S. citizen has died at the hands of Chechen rebels — during the 2002 Nord-Ost hostage siege in a Moscow theater. Interestingly, it was after the Nord-Ost drama that bin Laden for the first and only time spoke of North Caucasus rebels in one of his many public addresses, describing them as victims of Russian aggression and a group in need of assistance. The first known links between bin Laden and the North Caucasus conflict date back to 1995, when bin Laden offered $1,500 toward a Kalashnikov assault rifle and travel expenses for each volunteer ready to fight in Chechnya, a Sudanese defector from al-Qaida told a U.S. court in 2001. Curiously, bin Laden was often filmed and photographed with a Kalashnikov in his hands or within reach. He claimed that the Kalashnikov belonged to a Russian soldier that he had killed while fighting the Soviet army in Afghanistan in the 1980s. In late 1996, al-Qaida's No. 2 and the most probable successor of bin Laden, Egyptian Ayman al Zawahiri, traveled to the North Caucasus in search of a new home for the terrorist organization after it was expelled from Egypt and Saudi Arabia. He was arrested in Dagestan for illegally crossing the border and spent several months in a local prison before being expelled. After that, al-Qaida made Afghanistan its base of operations. Following the 9/11 attacks, several reports surfaced that two of the plane hijackers had fought in Chechnya and a third had told friends prior to the attacks that he was going to train in an al-Qaida camp in Chechnya or Afghanistan. Several al-Qaida operatives arrested over the past decade, including suspects nabbed in London in 2003 for trying to produce the powerful poison ricin in their apartment, either fought or trained in Chechnya or Georgia's Pankisi Gorge, which is predominantly inhabited by ethnic Chechens. Any foreign insurgent killed by the police or security services in the North Caucasus — including most recently on April 21 in Chechnya — is automatically labeled as an al-Qaida representative by Russian officials. North Caucasus-based foreign fighters, described as "members of the roaming brotherhood of jihadi paladins" by U.S. researcher Brian Glyn Williams, who is an authority on al-Qaida's links to Chechnya, are believed to have first surfaced in Chechnya in 1995. While the small group of foreign fighters considered Chechnya just another battlefield in the global jihad, it quickly became a strong force competing for influence with the largely secular Chechen separatists. Some of the fighters are believed to have fought against the Soviet troops in Afghanistan, just as bin Laden did. The alliance between the fighters, led by the late Saudi-born Emir Khattab and Basayev, gave Russian authorities a pretext to paint the leaders of the North Caucasus insurgency as part of al-Qaida's global effort. In 2003, as the second war in Chechnya was in full swing, then-President Putin told journalists in Paris that al-Qaida had retained its presence in the North Caucasus. "There are no longer al-Qaida camps in Chechnya, but its money and trainers remain," he said. Still, not a single Chechen has ever been arrested outside Russia for involvement in al-Qaida. The few Russian citizens arrested by coalition forces in Afghanistan and then jailed in the Guantanamo prison comprised natives of Tatarstan, Bashkortostan and Kabardino-Balkaria. All were later sent back to Russia, where they were released. Andrei Soldatov, a security analyst with the Agentura think tank, said playing up al-Qaida's presence in the North Caucasus helps Russian authorities pretend that they are fighting a common enemy with the United States and other Western countries. "This naturally allows them to undercut foreign criticism of the brutal anti-terrorism efforts in the North Caucasus," he said. Enver Kisriyev, a Caucasus expert with the Institute of Ethnography and Anthropology of the Russian Academy of Science, concurred, saying, "Claiming to be fighting al-Qaida allows federal and local security officials to often operate outside the legal limits." Bin Laden's death will have little effect on the activities of North Caucasus rebels because they do not share al-Qaida's global goal of fighting the United States, which it sees as the biggest enemy of Islam, Soldatov said.